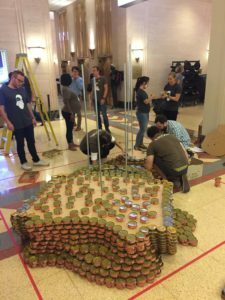 Please vote TODAY for our team’s entry for CANstruction! Canstruction is a unique world wide charity which hosts competitions, exhibitions and events showcasing colossal structures made entirely out of full cans of food. Canstruction Chicago (under the umbrella of Canstruction) is a design/build event which benefits the Greater Chicago Chicago Food Depository. 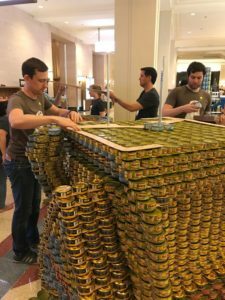 Teams comprised of professionals from the AEC industry fundraise for, design, and build structures composed of non perishable food items. These “Cansculptures” are housed in the first floor of the Merchandise Mart and are on display to the public as a giant art exhibition. 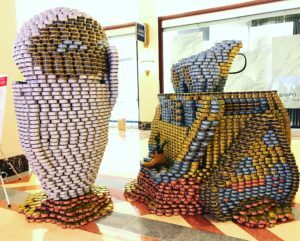 The “Cansculptures” are judged in various categories by a celebrity chef and prominent members of the AEC industry. Canstruction Chicago culminates in an awards presentation and cocktail party at the Merchandise Mart. In our world today, 40% of all food goes to waste. Fast forward 700 years and we might find WALL-E, a hardworking and lovable robot, all alone on Earth, compacting debris into solid block structures. WALL-E knows all too well what waste looks like, yet remains hopeful that life may again be sustained on Earth. Upon meeting an advanced search-droid named EVE, WALL-E discovers companionship and how, together, they can nurture Earth back to a healthy balance and sustain all living creatures. With the help of our sponsors, WALL-E and EVE are working to educate humans about food waste and reliEVE hunger.